Carl Jackson is one of golf’s more celebrated caddies. Many know him as Ben Crenshaw’s looper on their winning bag at the 1984 and 1995 Masters. Not so known are Carl’s brothers Austin, Bill, Bud and Melvin who got their caddie starts at Augusta National thru Carl. Farrell Evans writes an excellent piece for The National on the once bigoted thinking at AN before saner, progressive minds prevailed at the hallowed club. It’s a long story but well worth your time. As the Masters evolved into one of the biggest sporting events in the world, the tournament offered Carl a lens onto the world’s changing racial politics. In the 1970 Masters, Gary Player—a white South African former Masters champion who had expressed support for his country’s apartheid government—drew the ire of the NAACP, which picketed the club. 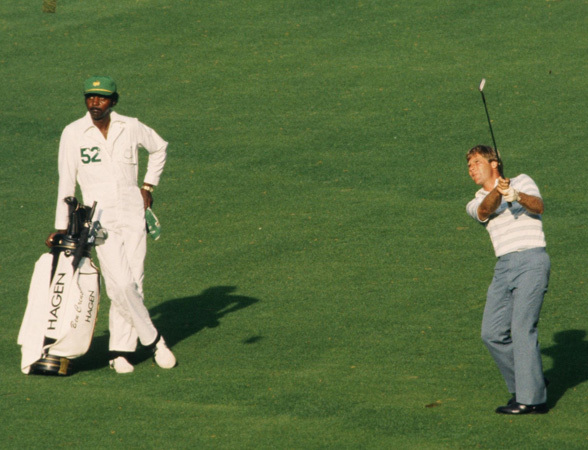 When Player’s caddie quit after receiving death threats, Carl took over his bag, reluctantly looking past the South African’s politics for the opportunity to caddie for a world-class player. As Carl matter of factly told me, “The NAACP was not going to pay my bills.” The next year he was moved to Oklahoma amateur Charlie Coe, before forging an enduring partnership with Ben Crenshaw in 1976. Augusta National operated under a strictly paternalistic order of white bosses and black workers, but outbursts of racial violence did occur within the gates of the club. On the afternoon of October 19th, 1976, Carl’s brothers Bud and Melvin and a few of their friends snuck onto the greens to go bream fishing in Rae’s Creek. When Charlie Young, the club’s white security guard, spotted the boys, he fired his 12-gauge sawed-off shotgun, hitting three of them, including Bud, who was struck in the right knee. Young later claimed to the club’s general manager that his gun had accidentally discharged as he was trying to load it. Jackson: Nothing bothers a caddie more, I learned, than being ignored, particularly when, as a black man, you’ve grown accustomed to being treated like you’re invisible.